Shopping at your local MCC Shop is an affordable and environmentally-friendly way to support a great cause. Not only will you find name brand items at super affordable prices, you’re also helping to send less garbage to the landfills. On top of all that, the proceeds from your local MCC Shop are used both locally and globally to support the work of the Mennonite Central Committee. What one person no longer needs, can be a treasure in someone else’s eyes. We get thousands of new items in our shops daily, so each visit to your local MCC Shop will be different. You’ll find items for your house and every part of your life and you’ll be saving money. 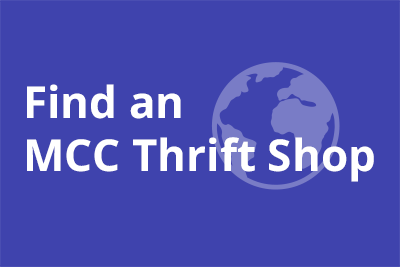 Spending money at your local MCC Thrift Shop is a fun way to support your community and the world. Many of our shops are open 6 days a week and some offer their items for sale on eBay. Click here to find your local MCC Shop.